Nestled in the mountains of northeastern Huntingdon County, historic Greenwood Furnace State Park offers a unique recreational experience. The park is on the western edge of an area of Central Pennsylvania known as the Seven Mountains. It is an area of rugged beauty, abundant wildlife, breathtaking vistas and peaceful solitude. 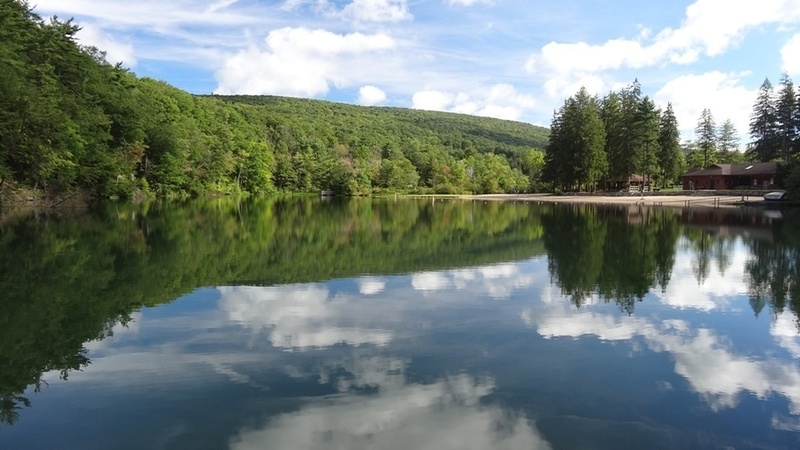 The park covers 423 acres, including a six-acre lake, and is surrounded by an 80,000-acre block of Rothrock State Forest. The park office is open 8 a.m. to 4 p.m. Monday through Friday year-round, and daily during the summer season. The park is a great inexpensive destination for swimming, hiking, fishing and exploring the outdoors. From Memorial Day to Labor Day the snack bar is open to make sure you have the energy to keep going. To enter the park and use the facilities is COMPLETELY FREE!! The Friends Group helps organize and participates in the annual Cleanup Days at the park. Check the Calendar on this page or visit the Volunteer Opportunities to learn more. Greenwood Lake was first built to provide water for a gristmill. It stands today as a reminder of the small town that once thrived there. The lake is used for recreational fishing, ice-fishing and swimming. The lake is regularly stocked with trout. Lifeguards will not be posted at the beach. Two serious fisherman are trying their luck on opening day of trout season. Greenwood Furnace State Park has a centrally located picinic area with several tables and seven pavilions that can be rented up to eleven months in advance. The picnic area has easy access to a playground, horshoe pit, volleyball courts, and a snackbar. There is a 51 site campground at Greenwood Furnace State Park. It opens at the beginning of trout season in mid-April and closes with the conclusion of deer season in late December. Forty-six of the camp sites have an electric hook-up. A showerhouse with flush toilets and laundry tubs is nearby. There are about 320 acres (130 ha) acres of woods open to hunting at Greenwood Furnace State Park. Hunters are expected to follow the rules and regulations of the PA Game Commission. The common game species are Ruffed Grouse, squirrels, deer and turkeys. Hunters may access the adjoining Rothrock State Forest by using the parking lots at Greenwood Furnace State Park and hiking in on the trails. The trails of Greenwood Furnace State Park explore the forests in the park and venture out into Rothrock State Forest. They also pass by the historical remains of Greenwood Furnace Iron Works. The trails are open to hiking, cross-country skiing, and also offer some snowmobiling. Chestnut Spring Trail is a 0.5-mile (800 m) "easy/moderate" trail marked with yellow blazes. It passes by several springs, a collier's hut, and a charcoal hearth as it winds its way up a hollow. Dogtown Trail is a 1-mile (1.6 km) "easy/moderate" trail marked with blue blazes. The trail is named for the former village of Dogtown, which in turn was named for the dogs that barked at the passing iron ore trains. Dogtown Trail is open for hiking and snowmobiling. The trail begins at the park campground and connects with Brush Ridge Trail. Fire Tower Loop is a 7-mile (11 km) "moderate/difficult" trail marked with blue blazes on the Greenwood Spur and red blazes on Ruff Gap and Snowmobile Road. This trail loops through the park and passes by the Greenwood Fire Tower on Broad Mountain, house foundations, and charcoal hearths. Greenwood Tower was built in the 1930s by the CCC and is still used by forest rangers to watch for forest fires. Greenwood Trail is a 0.5-mile (800 m) "easy/moderate" trail marked with red blazes. This short loop begins near the picnic area at pavilion six and passes through a diversity of trees, ferns and wildflowers. Lakeview Trail is a 0.25-mile (400 m) "easy/moderate" trail marked with white blazes. It runs along part of the edge of Greenwood Lake. Monsell Trail is a 1-mile (1.6 km) "moderate" trail marked with yellow blazes. The trail intersects with Greenwood Trail and links the campground to the Standing Stone Trail. Monsell Trail passes through a pine plantation left over from the days of the ironworks. Ore Banks Trail is a 1-mile (1.6 km) "moderate" trail marked with yellow and red blazes. It shares part of its trails with Chestnut Springs Trail (yellow blazes) and Brush Ridge Trail (red blazes). Ore Banks Trail passes over the top of a ridge with a view of the park and the remnants of Brush Ridge Ore Banks where iron ore was extracted from the ground and transferred to the furnace. The trail then follows the path used by the mule-drawn railroad that transported the iron ore to the furnace. Stone Valley Vista Loop Trail is a 3.5-mile (5.6 km) "moderate" trail marked with blue (Turkey Trail) and orange (Standing Stone Trail) blazes. Part of the trail follows a logging slide used during the days of the iron furnace. Viantown Trail is a 0.25-mile (400 m) "moderate" trail marked with yellow blazes. It follows the old wagon road that connected Greenwood Furnace with Viantown and crosses Brush Ridge. Greenwood Furnace State Park is also a trail head for two much longer backpacking trails that pass through the Appalachian Mountains of Pennsylvania. The Pennsylvania Mid State Trail is a 522.6-kilometre (324.7 mi) trail that runs from the Maryland state line to the New York state line and connects to the park via the Greenwood Spur. The Standing Stone Trail is a 72-mile (116 km) backpacking trail that connects the park to the Tuscarora Trail, which in turn connects with the Appalacian Trail. A walk through historic Greenwood Furnace evokes images of the community that flourished here from 1834 to 1904. Greenwood Furnace was a busy industrial complex, with all the noise and dirt of a 19th century ironmaking community. The village throbbed with life: the roaring of furnace stacks, the shouts of the workmen, the hissing of the steam engine, the creaking of wagons loaded with charcoal, and the cast house whistle signaling another pour of molten iron. The furnaces were hot (3,000 degrees Fahrenheit) and cast clouds of smoke and cinders into the air, which rained down on grass, people, livestock and buildings, rendering everything sooty and gray. At night, the fire’s red glow lit the sky, probably allowing residents to walk about without lanterns. Greenwood Furnace was a village built around an inferno. Originally, the iron ore for Greenwood was transported by wagon trail from the Big Valley. In 1839 ore deposits were found at nearby Brush Ridge, and a narrow gauge rail track was laid to improve the transportation of the raw ore. The picture of the iron wagon also shows this track. Other than the small section on display, none of the original track remains between the furnace site and the ore beds, located three miles away. After burning was completed, the charcoal was transported by wagon to the charging shed. Carriers had to be very careful, as the fresh charcoal would sometimes ignite when exposed to the rushing air. Early carriers would tip the load to prevent loss of the wagon, while later designs enabled the driver to "dump" the load on the road by opening the bottom of the wagon.The making of charcoal is an ancient practice. By covering wood prior to burning, charcoal is obtained, rather than simply wood ash. The pictures show a stack of wood ready for covering with dirt and leaves. Once ignited, the stack would burn for 10-14 days, and would require constant attention. The picture shows a collier working on the mound, probably to either repair an opening in the cover, or adjusting the venting. The charcoal wagon at the park today. There is another wagon in the Park's blacksmith shop.